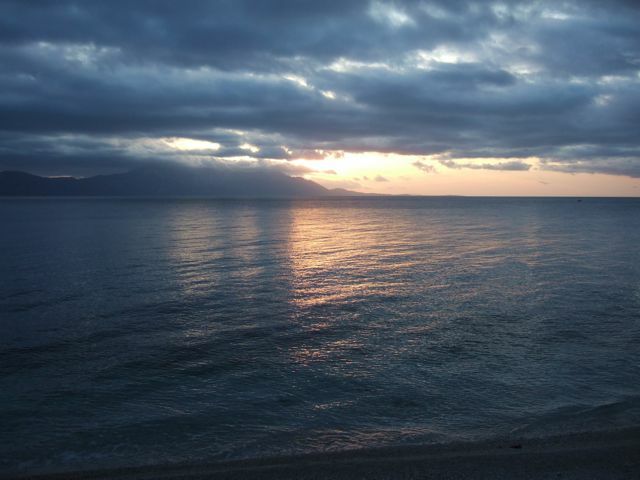 Villa Maja is located in Gradac, a picturesque Dalmatian town, nestled between the foothills of the Biokovo Mountain range and the Adriatic sea, on one of Europe's finest coastline. 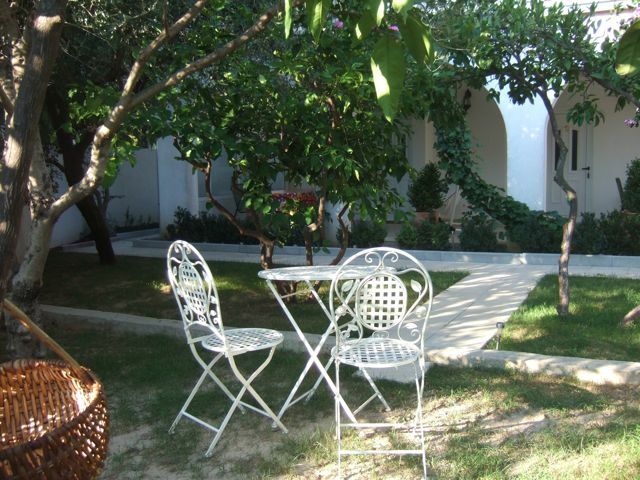 Villa Maja is just a 5 minute walk away from the crystal clear water of the Adriatic and the town beach promenade. 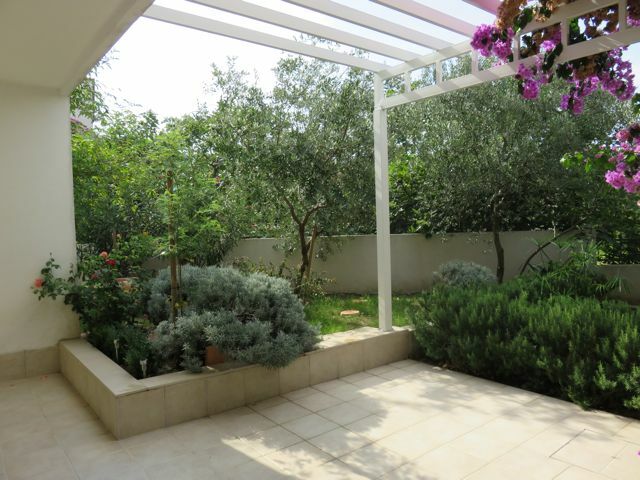 The THREE GARDEN SUITES, rated 3 stars by the Croatian Tourist Authority, are on the ground floor, on the garden side, facing south. 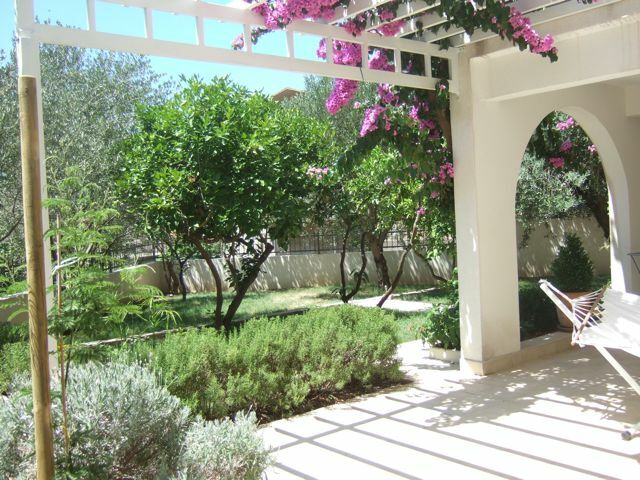 They all have access to a large common and covered patio with plenty of outdoor space, and a lovely Mediterranean garden full of Bougainvilleas, olive and lemon trees. 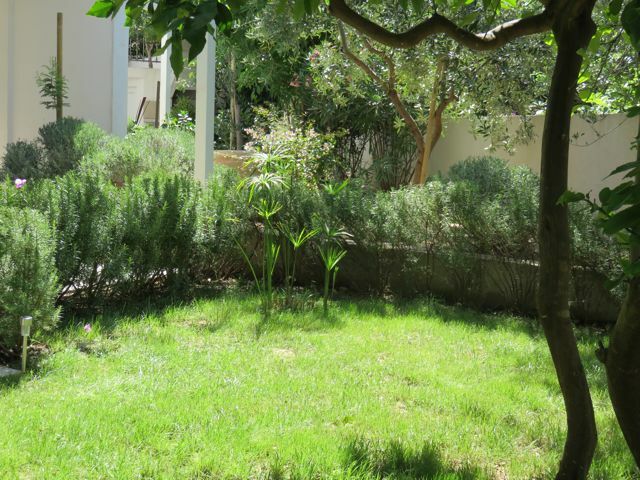 The garden is completely enclosed within stone walls making it a very peaceful place to relax. 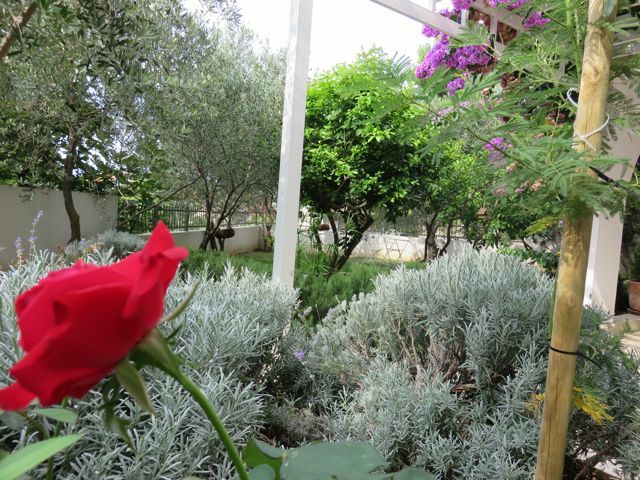 The patio is a beautiful area, furnished with tables and chairs for outdoor dining. The longest white pebble beach of the Dalmatian coast is just 100 meters away and is accessible, from the garden,through a shaded pathway. 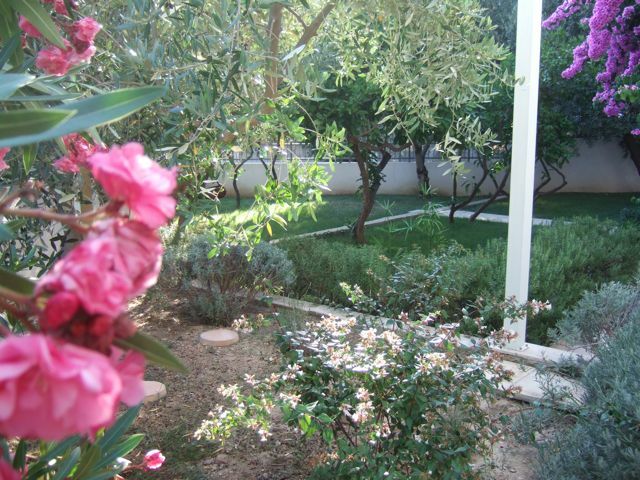 It is an ideal location for families looking for peace and tranquility. The V.I.P. 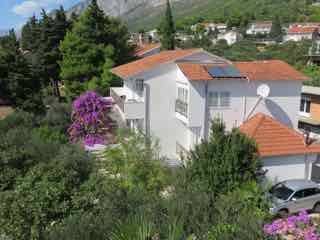 SUITE, rated 4 stars by the Croatian Tourist Authority, is located on the second and top floor of the Villa. 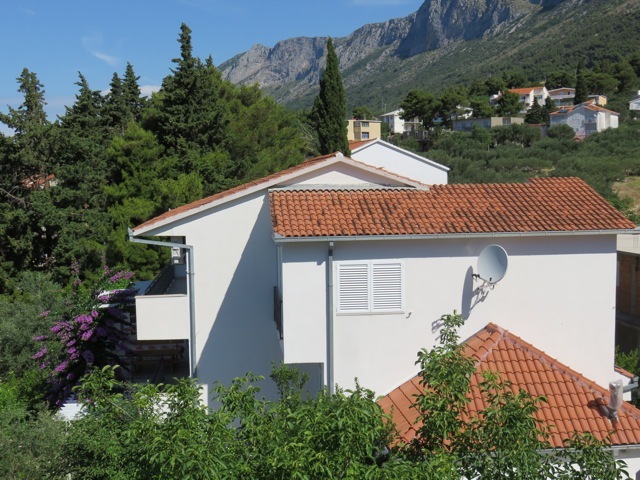 This elegant apartment has two bedrooms and two bathrooms, and offers beautiful views of the Adriatic and the Pelejsac peninsula on the south side and of the Biokovo mountain range on the north side. GARDEN SUITE no. 1: [Capacity 2 + 2] This brand new 35m2, air conditioned, one bedroom apartment is located on the ground floor, on the south side. The bedroom has a double bed, 2 bunk beds, 2 night tables, a closet, a dresser, a satellite TV. The kitchenette/dining room has a refrigerator/freezer, a microwave oven, 2 hotplates, table and chairs. The bathroom has a shower, a pedestal sink and a toilet. 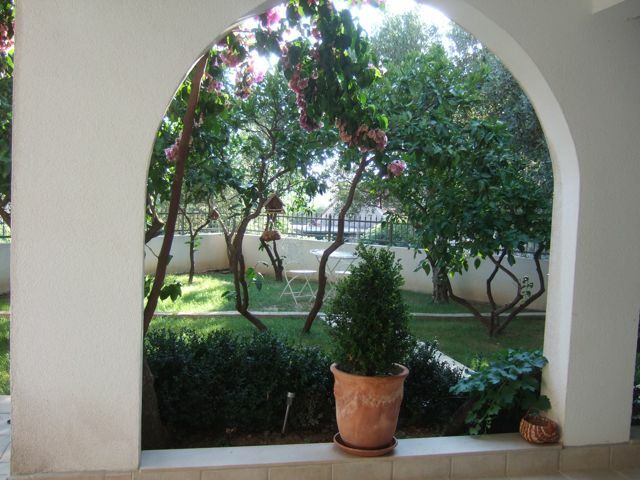 The apartment opens up to the beautiful patio and the lush mediterranean garden. The patio is perfect for "Al fresco" dining. 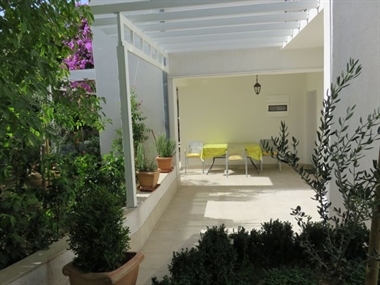 GARDEN SUITE # 2: [Capacity 2 + 2] This brand new 25m2, air conditioned, studio apartment is located on the ground floor, on the south side. The bedroom has a double bed, 2 bunk beds, a closet, a dresser, a satellite TV, table and chairs. The kitchenette has a refrigerator/freezer, a microwave oven, 2 hotplates.The bathroom has a shower, a pedestal sink and a toilet. 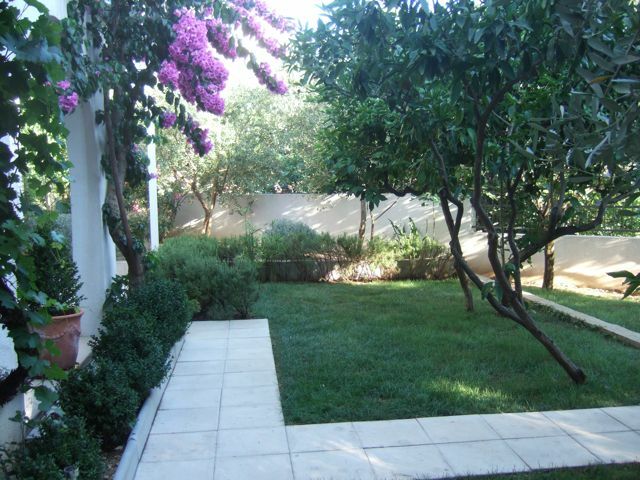 GARDEN SUITE # 3: [Capacity 2 + 2] This brand new 35m2, air conditioned, studio apartment is located on the ground floor, on the south side. The bedroom has a double bed, 2 bunk beds, 2 night tables, a closet, a dresser, a satellite TV, table and chairs. The kitchenette has a refrigerator/freezer, a microwave oven and 2 hotplates. The bathroom has a shower, a pedestal sink and a toilet. V.I.P. 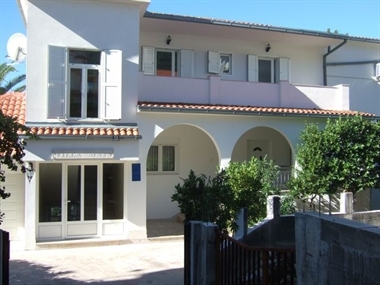 SUITE: [Capacity: 4 + 2] This elegant, brand new, 110m2, air conditioned apartment is located on the top floor of the villa. Accessible by an interior staircase, this apartment opens up to a spacious hallway. Along the full length of the apartment there are two balconies. One with sea view on the south side and one with mountain view on the north side. There is a third balcony on the west side with sea and mountain views. From the hallway there is access to the dining room area, the kitchen, the living room, the two bedrooms and one of the two bathrooms. The bright modern kitchen is well equipped with 4 hotplates, an electric oven, a refrigerator/freezer, a dishwasher, a microwave oven, a coffee maker, and plenty of dishes, glasses and kitchen utensils. The kitchen has a glass door leading to the balcony on the mountain side. Close to the kitchen, the dining room area can seat 6 people and has two large windows, one with sea view and one with mountain view. The spacious living room is bathed in natural light with its two glass doors leading to the sea view balcony. The living room has one chesterfield, two sofas, and a satellite TV. There are two bright and spacious bedrooms with large beds, over sized closets and large glass doors leading to a balcony. Each bedroom can accommodate one extra bed. The master bedroom has its own en-suite bathroom. Each bathroom is equipped with a bath tub/shower combination, a pedestal sink and a toilet. The second bathroom is equipped with a washing machine. There is a small storage room equipped with: luggage racks, safe deposit box, iron and ironing board. There are three individually controlled air conditioning units: one in the living room and one in each bedroom. Smoking is prohibited inside the apartments. Pets are not allowed. Parking is limited to one car per apartment. 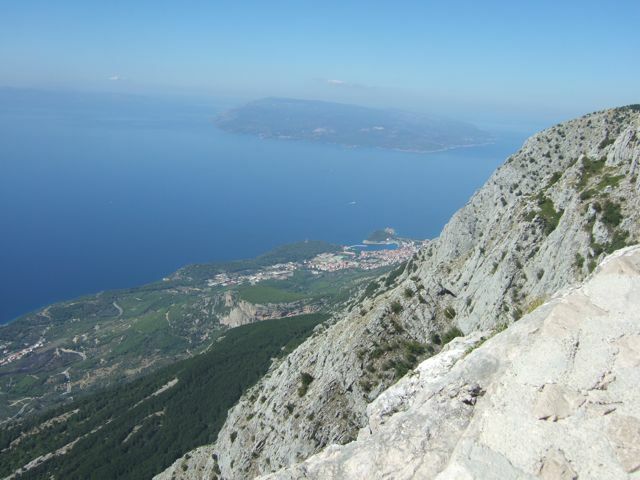 The little coastal town of Gradac is nestled between the foothills of the Biokovo mountain range and the blue water of the Adriatic, on one of Europe's finest coastline. The visitor wishing to escape the stress of modern day life, will love its warm mediterranean climate, its blue skies, its dazzling beaches and the natural and unspoiled beauty of its coastline. 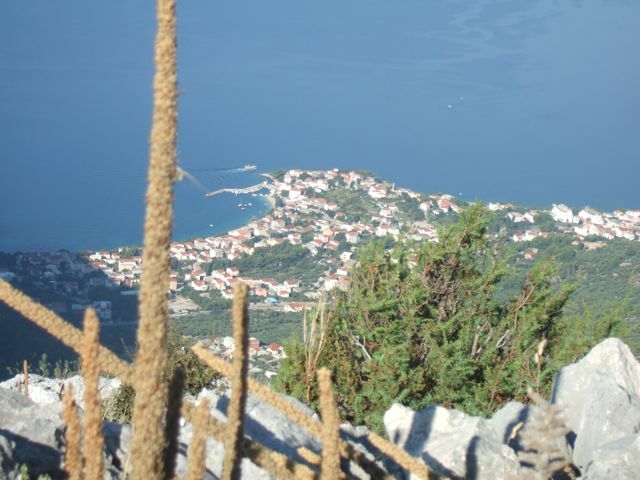 The steep slopes of Biokovo are dotted with old perched villages watching over ancient olive groves. 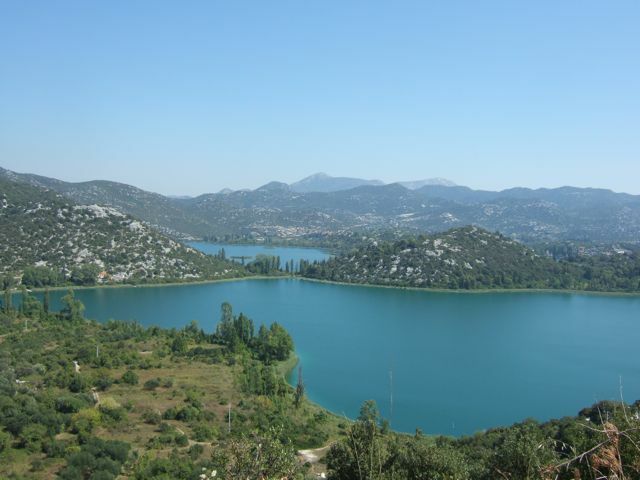 The mountain trails offer sweeping views of the shoreline and its neighbouring islands. This is a place of timeless beauty. Like in most Dalmatian coastal towns, the seafront promenade is lined with lively cafés, restaurants and a variety of little shops. The old harbour is still used by small fishing boats and this is where the fish market is held every morning. 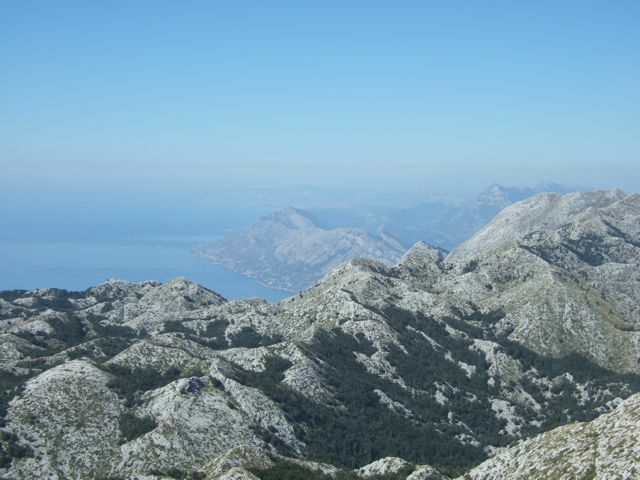 Gradac is located, midway between two World Heritage Sites: the iconic city of Dubrovnik, pearl of the Adriatic, and the ancient city of Split, literally built inside the Diocletian Palace. 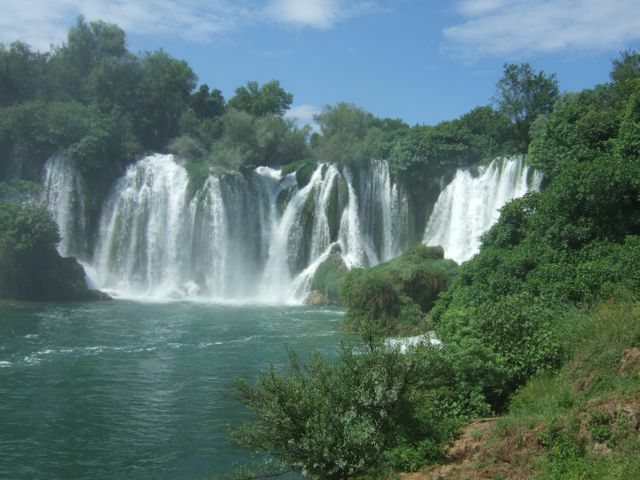 In the summer, regular boat trips are available, from Gradac to the wonderful islands of Hvar and Korcula, the actual birth place of Marco Polo.